§ 55-1. Design of official seal. There shall be an official seal of the City of Kingston, New York, which shall consist of a circular device in the form of a disk with the words "City of Kingston, New York" at the top of the disk and the date " 1652 " at the bottom thereof. In the outer ring of the disk shall be the traditional olive branch. The pictorial symbols shall consist of the Senate House, a Hudson River sloop shown in full sail upon the river and the Catskill Mountains in the background with the sun rising above the scene. § 55-2. Design of official flag. There shall be an official flag of the City of Kingston, New York, which shall consist of three equal and horizontal stripes, in colors of Nassau orange, white and blue, with a pictorial field emblazoned upon the center of the flag. This field shall be harmoniously incorporated into the total design and shall depict the Senate House, a Hudson River sloop in full sail upon the river, the Catskill Mountains in the background and the sun rising above the scene. These symbols shall be contained in white elliptical design with the words "Kingston, New York," in gold across the top of the ellipse. At the bottom thereof shall be a gold banner bearing the date "1652." On either side of the date and curving upward at the sides of the ellipse shall be olive branches to complete the design. § 55-3. Explanation of design. The Nassau orange, white and blue stripes and general design stand for the flag of the Netherlands, under the sovereignty of which the City of Kingston was founded in 1652. The Senate House thereon commemorates the historical fact that the City of Kingston was the first official capital of the State of New York and the site of the creation of the State Government under the infant Republic in 1777. The Catskill Mountains connote majesty and permanence. The sun with its radial beams holds forth the promise of Kingston's gleaming future predicated upon its noble past. Kingston's dedication and devotion to the causes and blessings of peace are depicted by the olive branch. The design of the seal carries out the basic significance of the original seal of the city without radical departure therefrom and is emblematical, historical and harmonious." Photos at: www.ci.kingston.ny.us/Assets/CityGovt/DCP_0477.jpg and www.ci.kingston.ny.us/Assets/CityGovt/Mayor.jpg. 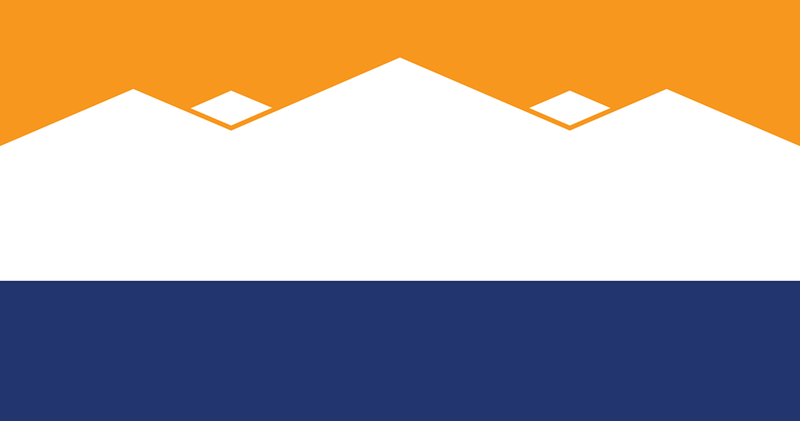 A proposal for a new flag for Kingston, NY is seen at www.facebook.com (source: "New Kingston Flag" Facebook page: www.facebook.com). - White: a mountain range with three large and two small peaks representing the Catskills (formally Catskill Mountains) and the two diamonds represent before and after the city was burned by the British on October 13, 1777, after the Battles of Saratoga. - Blue (same as NY State blue): representing the Hudson River and the city's history of manufacturing bluestone. It is influenced by "The Princesvlag", the New York City flag, the seal of Kingston (en.wikipedia.org), New York State flag, and the Albany flag. www.dailyfreeman.com and also explained briefly by him on this video, dated June 15, 2016 (player.tout.com) from the same newspaper. "As early as 1614, the Dutch had set up a factorij (trading post) at Ponckhockie, at the junction of the Rondout Creek and the Hudson River. The first recorded permanent settler in what would become the city of Kingston, was Thomas Chambers, who came from the area of Rensselaerswyck in 1653. The place was called Esopusafter the local Esopus tribe. As more settlers arrived, tensions developed between the Esopus and the Dutch, in part due to the Dutch selling alcohol to the young Esopus men. In the spring of 1658, Peter Stuyvesant, Director-General of New Amsterdam, arrived and advised the residents that if they wished to remain they must re-locate to high ground and build a stockade. Tensions continued between the Esopus and the settlers, eventually leading to the Esopus Wars. In 1661 the settlement was granted a charter as a separate municipality; Stuyvesant named it Wiltwijck(Wiltwyck). It was not until 1663 that the Dutch ended the four-year conflict with the Esopus through a coalition of Dutch settlers, Wappinger and Mohawk. Wiltwyck was one of three large Hudson River settlements in New Netherland, the other two being Beverwyck, now Albany, and New Amsterdam, now New York City. With the English seizure of New Netherland in 1664, relations between the Dutch settlers and the English soldiers garrisoned there were often strained. In 1669, Wiltwyck was renamed Kingston, in honor of the family seat of Governor Lovelace's mother. In 1777, Kingston became the first capital of New York. During the summer of 1777, when the New York State constitution was written, New York City was occupied by British troops and Albany (then the second largest settlement in New York and capital of the newly independent State of New York) was under threat of attack by the British. The seat of government was moved to Kingston, which was deemed safer. However, the British never reached Albany, having been stopped at Saratoga, but they did reach Kingston. On October 13, 1777, the city was burned by British troops. Kingston was incorporated as a village on April 6, 1805. In the 19th century, the city became an important transport hub after the discovery of natural cement in the region, and had both railroad and canal connections"
image.dailyfreeman.com (source: www.dailyfreeman.com). It was not immediately clear how long the current flag has been in use, though its design dates to at least 1920 (source: www.dailyfreeman.com), as the City Code's Chapter 55 ( ecode360.com) states.